Hurricane Florence was the second wettest U.S. storm on record. It inundated thousands of square miles in the Southeast—and not just on the coast. Phenomenal amounts of rain kept rivers in North and South Carolina flooded two weeks after the storm’s landfall, with the Cape Fear River in Wilmington, NC reaching its highest level on record. Florence claimed dozens of lives; by some estimates, it delivered economic damages between $38 and $50 billion. The high end of that range would make it the seventh-most costly storm in American history. Climate change makes hurricanes wetter in two ways. Warming from climate change supercharges the water cycle — the process of evaporation, condensation, and precipitation — making for heavier rain, and it raises sea levels, creating a storm surge that is deeper and one that pushes farther inland. Take rainfall. Our planet is mostly water, and a warmer atmosphere evaporates more of it. As the oceans heat up, they provide more fuel for hurricanes, which draw their energy from warm ocean water. That increases the amount of rain that storms can produce. Independent post-mortem studies of Hurricane Harvey last year from MIT, the National Center for Atmospheric Research, and the international World Weather Attribution project clearly showed the fingerprints of this climate-change impact on rainfall totals. Next, consider the effects of climate change on storm surge, or the push of ocean water onshore that happens when a hurricane nears land. 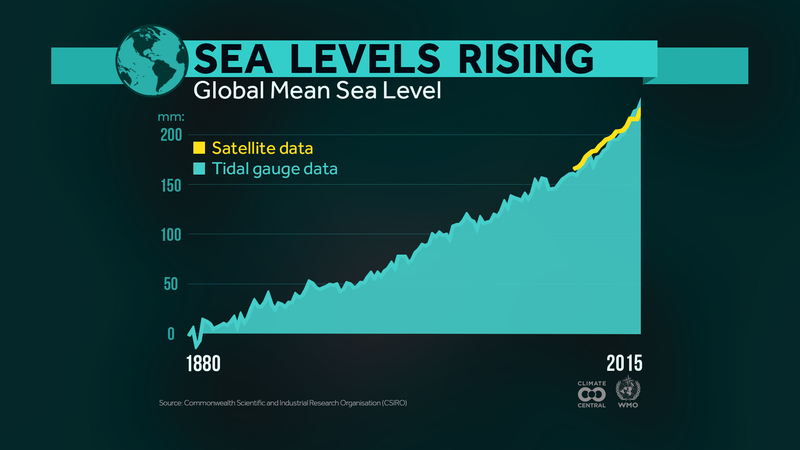 Thanks mostly to climate change, global sea levels have already risen about seven inches since 1900. That rise is accelerating—with a detectable effect on storm surge. In 2012, Sandy produced a severe storm surge, and climate change added an extra eight inches to it—the difference between water reaching the floor and reaching into residential electrical sockets. Depending on how much more greenhouse gases are emitted, the National Oceanic and Atmospheric Administration estimates that somewhere between eight inches and 6.6 feet of sea level rise are likely by the end of the century. But the lower end of that range would require an immediate slashing of greenhouse gas emissions and the removal of carbon dioxide currently in the atmosphere, meaning the middle or upper parts of that range are far more likely, and a much larger rise in in sea level is certain in the years that follow. In the aftermath of devastating hurricanes, people want to know whether climate change was responsible. Strictly speaking, climate change is not the single cause of any storm—just as it’s impossible to say that a baseball player’s use of steroids caused him to hit a particular home run. But in each case, it made the event more likely. In a way, the climate is on steroids: the additional greenhouse gases added to the atmosphere from the burning of fossil fuels have made both the atmosphere and oceans warmer than they were 100 years ago. While there is not much evidence that the overall number of hurricanes is increasing, there is plenty to suggest that the strongest of these storms are getting stronger—which is consistent with the projections summarized by the Intergovernmental Panel on Climate Change. In fact, satellite analysis indicates that some of the strongest hurricanes on record globally (known regionally as typhoons or cyclones) have come since 2015. Early research also indicates that hurricanes are starting to intensify more rapidly, leaving less time for people living near the coast to prepare for the impacts of a strengthening storm. 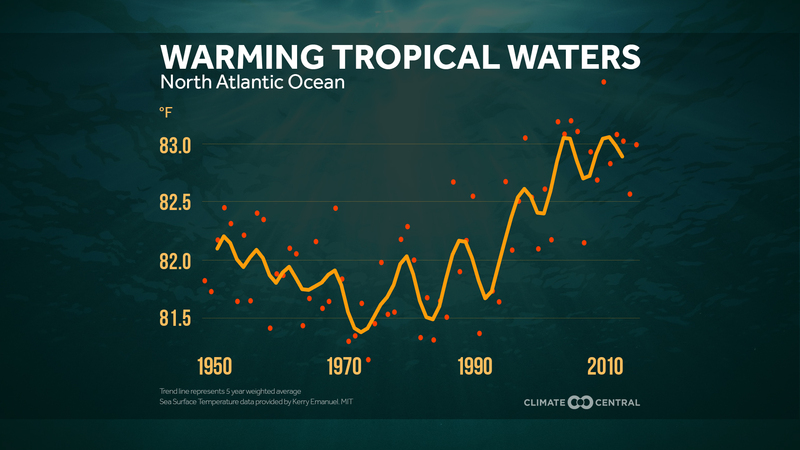 And while there have always been variations in the number of hurricanes in a season, the warming oceans may be starting to overpower the natural variations in the year-to-year number of the strongest hurricanes. Finally, there is also early evidence that the forward speed of hurricanes is slowing down. Slower-moving storms have more time to dump massive amounts of rain. That, too, may be related to changes in the climate. The forward speed of hurricanes is largely ruled by winds in the upper atmosphere — the jet stream — which are driven by the temperature differences between the equator and the poles. With the Arctic warming twice as fast as the rest of the rest of the planet, those temperature differences are decreasing, slowing the jet stream winds. This topic continues to be researched vigorously. Loss of life, property damage, groundwater contamination, infrastructure failure, and pollution runoff are all impacts of flooding that will need to be dealt with in the years to come. Hurricanes are not going away. Without adaptation—or cutting the emissions that cause climate change—their impacts are only likely to get worse. Our searchable media library has multimedia related to climate change (examples above) for you to use at no cost. Sign up to get localized climate change story ideas delivered to your email via our Climate Matters in the Newsroom project.